Assam State Disaster Management Authority has recently announced a recruitment notification . 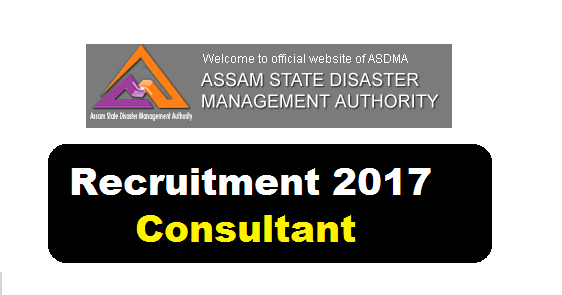 As per as the Assam State Disaster Management Authority Recruitment 2017 , Applications along with Prescribed Application Form, attested copies of all Certificates, Marks Sheets, recent passport size photo, etc. are invited from intending candidates, who are Indian Citizens, for engagement on contract basis under ASDMA. Following are the details of the posts under Assam State Disaster Management Authority Recruitment 2017 with post details, number of vacancies, age limit, salary, required qualification with application details. The applications, complete in all respects,-along with testimonials should be submitted on or before four days from publication of advertisement and sent to: Email: asdmaghy@gmail.com. Applications received after the deadline will be summarily rejected. No application will be received through fax. The applicant should clearly mention the name of the post applied for on the subject line in the email. The applicants may have to appear for a written test / interview at the venue, date and time as decided and directed by the Authority, at their own cost. No TA / DA shall be paid for the purpose. Candidates not having the requisite qualifications are liable to be summarily rejected. Therefore, candidates are advised to ensure that they fulfil the prescribed eligibility before applying, details of which are available on ASDMA website. The Authority also reserves the right to accept or reject any application without assigning any reason thereof. Canvassing in any form will lead to summary disqualification.